Yes, it’s in Russian. But outside of that it’s exactly like the poster that is being displayed in ShoWest, so it will do for now. Let’s start with the obvious. Dinosaurs? Didn’t the first film happen in an age when dinosaurs where already extinct? Is there some type of time traveling involved in this third outing? Or do they just find a bunch of dinosaurs frozen somewhere? 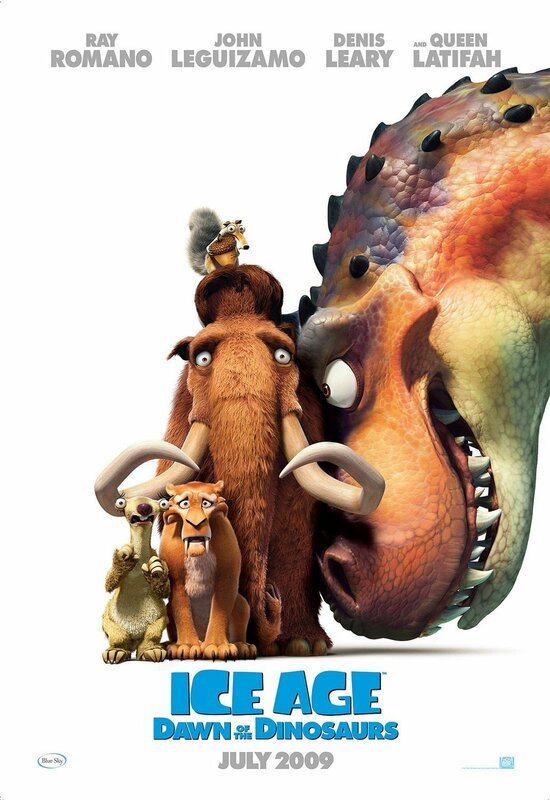 But whatever crazy explanation they come up with, the people at FOX/Blue Sky seem to have decided that Ice Age 3 will have Dinosaurs. And apparently they are planning to use them a lot in the selling of the film. Ice Age … with lasers dinosaurs! The poster certainly seems to be following that strategy, and doing a good job of it. We have our beloved cast of characters from the previous films, but they are looking mighty afraid and are squashed against a corner because of the huge T-Rex head. It’s funny, it gets the point across and it looks great. A fine poster. Now, the Ice Age series has had some seriously great posters, some of them quite a bit better than the films themselves, I would argue. This is not really at the top of the heap, but it does keep with the tradition of excellence. Reminds me of Pixar’s Finding Nemo poster. Personally, I love it. The expressions on their faces kill me!